PGSM. Character. たかい Takai is Motoki's odd, turtle-obsessed friend. He has numerous turtle related items and turtle clothing. Although he is uncomfortable around girls, he goes on a "date" with Rei at the amusement park, but became very nervous. PGSM. Actor. 武子直輝 ( たけし なおき) The actor who played Tsukino Shingo in the live action. He was born March 28, 1993. His agency is Gekidan Tohai. PGSM. Item. 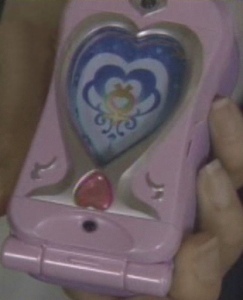 テレティアS Communication device used by the senshi. This pink phone can be used to disguise oneself as anyone by taking the person's picture. It can also be used as a regular cellphone.